Stand-up pouch packaging of Spilva mayonnaises, developed in cooperation with the Ukrainian company Ukrplastic, won the competition of packaging industry professionals Ukrainian Star of Packaging 2016 (Українська зірка упаковки 2016), organized in Ukraine, in the food category. With this victory the packaging of Spilva mayonnaises qualified for participation in the international World Packaging Organisation competition. The competition Ukrainian Star of Packaging 2016 is organized by the Ukrainian Packagers’ Club, which annually announces the best packaging industry professionals in Ukraine. This year, the competition took place for the 18th time, and more than 70 works were submitted for assessment to the panel of judges. The panel of judges was composed by experts and industry professionals, who assessed packaging design, quality of the material and performance originality. Awarding of winners of the competition Ukrainian Star of Packaging 2016 takes place on 13 April, during the International Forum for Food Industry and Packaging (IFFIP) 2016 in Kiev. ‘Appreciation by industry professionals for the quality of Spilva packaging serves as a proof of our huge efforts for ensuring functionality of packaging. Each such appreciation gives satisfaction, however, we can’t rest on our laurels. Therefore, we perceive this assessment as a stimulus for further work on improving the functionality of packaging and introducing other production innovations,’ admits Dana Erciņa-Užāne, the Marketing Director of Orkla Foods Latvija. In the last September, Spilva mayonnaises in stand-up pouches were awarded the 3rd place in the international packaging competition ‘Packaging No. 1 of the Exhibition Riga Food 2015’, organized by the International Exhibition Company BT 1 in cooperation with the Latvian Packaging Association. 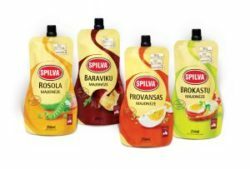 The innovative stand-up pouch packaging of Spilva mayonnaises was introduced in the manufacturing process in summer of 2015. In addition to its special design the new packaging is made of a special hermetic material, which protects the product from sunlight and air exposure. The innovative packaging with a screw cap preserves the product freshness for a longer period of time and makes its use and storage more convenient. Since the start of 2016, Spilva dressings are also packaged in stand-up pouches. This stand-up pouch packaging was introduced by implementing an investment project in cooperation with Latvian Investment and Development Agency (LIAA); the total amount of investment made within the project comprised 761,327 euros, 339,167 euros of which were provided by co-financing of structural funds of the European Union.